Models and practices of social learning have been present for some time now inside organizations, even before the introduction of social collaboration platforms or of social intranet in multinational enterprises. Social Learning practices identify cooperation and sharing processes that people carry out every day in their professional context while working. 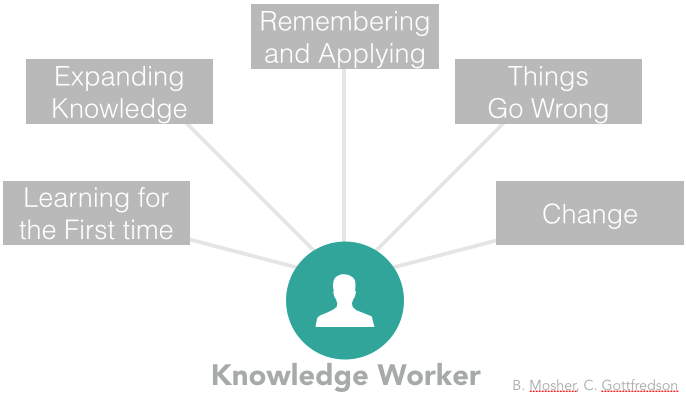 In modern organizations, as a matter of fact, “knowledge workers” face problems they have to solve during their performance and need information, data and know how. These needs urge them to search for confrontation and to exchange experiences, solutions, updated contents, information, etc., creating thus the noise we know under the name of cooperation and sharing processes. Bob Mosher and Conrad Gottfredson (http://elearningindustry.com/implementing-five-moments-of-need-model) identify 5 moments of learning need which people face during their work. In my opinion, these 5 performance-linked moments repesent the 5 main reasons/occasions that prompt people to collaborate and share knowledge, and therefore to generate social learning processes or Social Learning. Changes, problems and unforeseen events, learning of new contents come out “on the job-site”. Therefore, Social Learning processes take place on the job-site, not during Training & Development Department sessions. Change takes place during performance and updated knowledge and learning are generated in close connection with the needs of workers and job / profession characteristics. Such awareness is crucial for all who deal with organizational learning and Social Learning. The goal is to implement “listening” methods and practices of performance and knowledge produced and possessed by people in order to intercept excellences, initiatives, suggestions and ideas which may add value to the organisation also on new services/products, and maybe also in new business areas. If learning takes place at the same time and place as performance, it is precisely there that individual and organisational new learning processes must be planned and implemented. Concerns the enhancement and exploitation of the organisation’s collaborative culture and the creation, inside professional or learning communities, of moments in which HR can identify experts in its work force, favouring the contact with the subjects who are facing the 5 learning reasons/occasions to improve their performances. It is a matter of creating policies, netiquette and processes that favour the getting in contact of subjects who can collaborate on the basis of passing/exchanging knowledge. Collaborative platforms allow to act these practices. I think this is the basic element of every Social Learning system. It goes along three axes. The first is the identification – already in the selection process – of subjects with a strong predisposition and ability for self-formation, self-development and self-updating of their own basic knowledge. The second axis consists in the definition of new Knowledge Management systems in a peer-to-peer logic (inside and outside the organisation) capable of promoting and facilitating the access to and sharing of information, knowledge, experiences and sources useful to the performance and basic knowledge increase of the single worker. The third regards the technological environment both in terms of personal knowledge management tools and knowledge mapping, and in terms of out coming of “new” experts also in new knowledge areas such as Personal Branding and Social Talent Management practices. 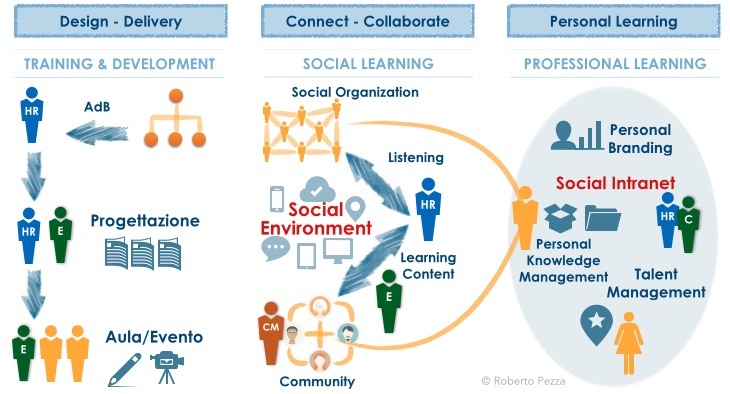 These three paradigms can be represented as a perimeter of new Social Learning Practices that the new Social HR can design and control in their own organisations. The path leading to the realisation of this Social Learning Practice requires work on the organisational culture, on rules, on trust between parts in order to put people in the best conditions to invest in their own self development, self learning and the free sharing of knowledge and experiences.